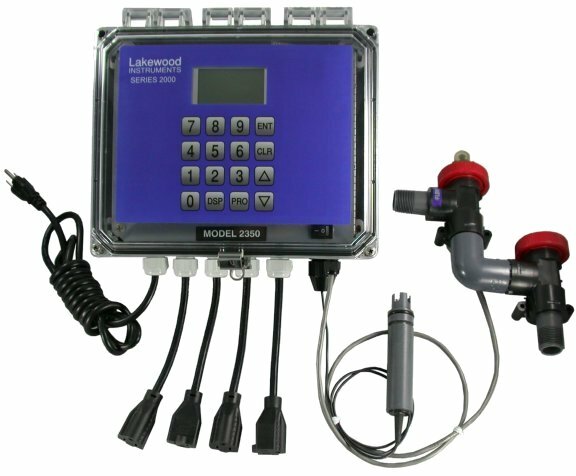 Two water meter inputs, pH input with sensor with 15 ft cable, flow switch input, four relay outputs, and Power On/Off switch are all standard features. 2350e LonWorks Technology-based pH controller with plumbing and flow switch. Four relays are integral to the system. The relays may be configured for pH high or low setpoints and alarms. pH range is 0-14 pH. Sensor has 15 ft. of cable. -35L Two 4-20 mA output configurable for remote data acquisition of pH.